Based on a medieval drink called posset that consisted of milk, often eggs and some form of alcohol like sherry or Madeira, eggnog was originally enjoyed by the British aristocracy. In the winter months, the wealthy would drink warm milk mixed with eggs, spices and liquors. Eventually, American colonies were able to harvest these ingredients from their own farms and began enjoying it as well. Fun Fact: The eggnog we consume today is uniquely American thanks to rum, a key component to the alcoholic version. The best part about eggnog is that it can be enjoyed by people of all ages, with or without liquor, warm or cold. 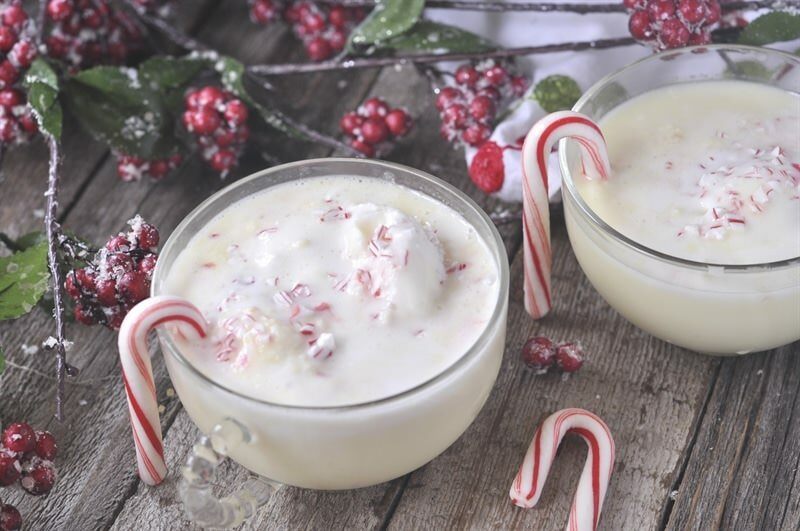 It can even be made into a peppermint eggnog punch, and I have a fabulous recipe for it. Enjoy! Set aside 2 or 3 round scoops of ice cream in the freezer for garnish. Stir remaining ice cream until softened. Gradually stir in eggnog and rum. Transfer to a punch bowl, and stir in ginger ale. Hang candy canes around the edge of the punchbowl. Float reserved ice cream scoops on top, and serve immediately.